Just like no man is an island, no conversion happens without the help of multiple marketing channels. True, there are plenty of these “assists” that we cannot track. For instance, word-of-mouth is nearly impossible to track. If a friend tells you she loves her new shoes, and you go buy the same pair of shoes that shoe company may never know that it was your friend’s endorsement that got you to type their brand name into a google search bar. However, in the online world we do have the ability to track these assists to some extent, we call them “assisted conversions.” So what is an assisted conversion? And here’s another way of explaining things, let’s say instead of hearing about that shoe company from your friend offline, instead you saw her comment on a photo on their company’s Facebook page. I go to that shoe company’s Facebook page, decide I really want to know if the shoes worn by the model in the cover photo come in red so I venture over to the site. BINGO! I get to the site and see that yes in fact they do come in red. But before buying, I just want to be sure there’s no other place I can find these shoes for less. So I check out a few department stores online, but they carry this specific red shoe I want. At this point I google the name of that shoe company again (because its’ easier to google things than type out the whole URL, right?) and I end up ordering those red shoes. In Google Analytics, organic search will be the channel that gets credit for this conversion, but since my first interaction with the shoe company was on social it will be considered an “assisted conversion.” Social assisted organic in making the final conversion. So why does this matter? Because oftentimes the assisted conversions provide us with some of the most valuable insights and we ignore it because frankly its hard to see. However, Multi-Channel Funnels in Google Analytics is here to solve that problem! On the first half of the page, it breaks down how many conversions you had and how many were assisted. As you scroll down to the second part of the page this is where things get interesting. You can place up to four channels in your Venn Diagram. It will show in the time frame selected how many times Direct & Social, Direct & Organic, and so forth assisted each other in making a conversion. I normally only look at two channels at a time. You can scroll over the shaded area where the two circles overlap to see the percentage of conversions the two channels assisted each other on, as well as the actual number (in case you didn’t want to both doing the extra math). This is a fantastic way to see which of your various channels are assisting each other in Google Analytics. And the best part is Analytics does all of the work for you! Constantly expanding your network and providing value to your followers is key. One way you can provide value is tweeting links to articles or news. Sure you can include your own thoughts on the piece but in essence you are giving your followers something to read. It’s important your followers also share similar interests with you, for me, one of my interests is fashion. While most of my friends from college (the main people I actually know and follow on twitter) aren’t constantly reading fashion blogs, I use twitter chats to find those that are and gain them as followers. 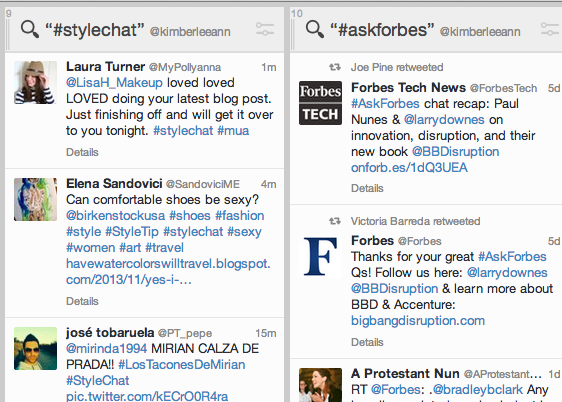 Twitter chats are an easy and fun way to go engage with others who share your interests. These chats are often hosted by one user who helps facilitate topics that will discussed. However, anyone using a particular hashtag can ask a question to fellow fashionistas or event to a specific person. One that I often participate in is #stylechat which happens every Wednesday from 12-1 pm (Pacific Standard Time).The chat happens really quickly and I try to answer as many questions as I can and also ask a few myself. There are chats for almost everything, it just takes a little work to figure out when they are happening. And if there isn’t one for something you are interested in, make one yourself and reach out to fellow twitter influencers to help get the word out about the chat. Follow people, engage with them, and before before you know it, you’ll have a dedicated twitter community. Pinterest is certainly one of the most time consuming social networks. I know I totally get lost looking up DIY projects and creating boards of mini decor for my fictional house. Pinterest was a big hit during the recession, as one may not have been able to afford the house of their dreams but they sure could have it all on Pinterest. Maybe after the economy started to turn around people started buying all their dream items stored away on their Pinterest? That’s one of many benefits for brands on Pinterest: linking pins to the product pages for items, which drives traffic to websites. I know in my personal use of pinterest for brands in the workplace I’ve seen clients garner as much as 55% of their web traffic directly from Pinterest. It’s actually crazy when you think about it that such a silly thing as a fictional wedding board someone creates could be what gets a bride to hire your company to plan that wedding. Another benefit for brands are hashtags or descriptions under pins on Pinterest. Those keywords can help your items show up in searches. I know I’ve started going to straight to pinterest especially to look for cute gift ideas or decorating ideas. If I have a particular color scheme or person I am shopping for it’s very easy to search and find relevant pins. Speaking of shopping, Pinterest now has a great tool for e-commerce sites called “price drop.” Now when you pin something, perhaps a lamp you fancied but didn’t actually buy because it was a little pricey, Pinterest will alert you when it is actually in your budget. You’ll get a conveient email sent to your inbox telling you that it’s now on sale. In a product-based company this gives you a fantastic advantage because it drives customers to your site multiple times and gives them a call to action to purchase products. As a brand your Pinterest page gives you a way to take customers inside your company. Personalizing boards with creative names and photos you can help give customers a better idea of the inspiration behind your brand. And then when they pin one of your products or images it typically stays on their board for eternity, so your brand repeatedly gets free marketing. Additionally all their followers see that pin as well, so that’s more impressions for you. Thanks to a coworker I recently learned that I’ve been using my web browser wrong for most of my life. I used to hop around Safari, Firefox, and Chrome all the time but I’ve come to realize that Chrome is a much more efficient browser. Here are some basic ways to customize your browser and all are reasons you should start using Chrome. 1. 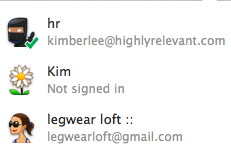 User Accounts: You can be signed into multiple accounts and manage them all in different windows. Each time you select a new user it opens in a different window. 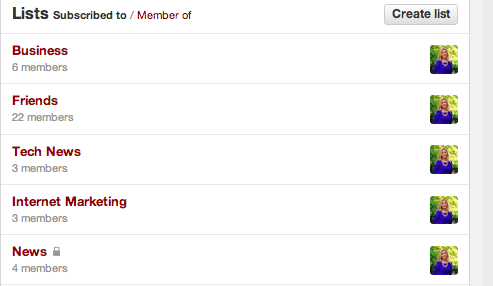 From there you can enter a window with all the extensions (covered next) that you need for that particular account. If I have a client that specifically follows Sc-Fi Shows and posts content for there, for example, I can quickly scan sites I have bookmarked in folders and post to that client’s social networks which are all accessible at once through extensions. 2. Chrome Web Store: The possibilities are endless, pretty much anything you can imagine you can create a shortcut to in this store. I specifically use the Pinterest, Tumblr, Tweedeck, Twitter, Yahoo! , and Gmail extensions most frequently. Since I am already signed in as that specific client or user in all of the accounts it will publish the content I want on the correct social media accounts. It’s a no-brainer for a social media manager to be using this! 3. Folders: So you probably already know about bookmarks and folders but just to remind you …using folders is an easy way to quickly scan sites you normally check. 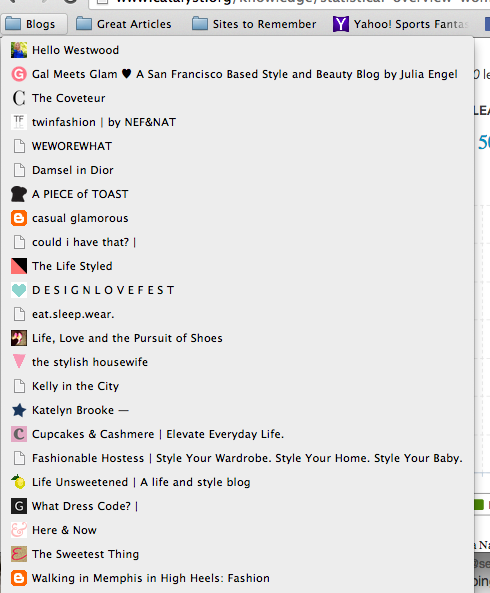 I always scan fashion blogs in the morning and then pin or post on tumblr my favorite articles using my chrome extensions for both so I never have to leave the page. In a half hour I can quickly scan dozens of sites and post all my social networks my favorite items. It’s a no-brainer for efficiency.